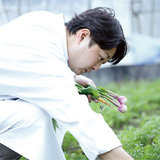 Hikariya-Nishi is the French restaurant that menu is based on nature and macrobiotic. It creates western culture in the aesthetic sense of Japanese. The person or thing you can meet in your life has a limit. It doesn’t care bad or good, all the connections are necessity that the god prepared. Cross over more than 100 years, you and Hikariya meet today. It’s not accident. Because this building has some meaning, so it stands here from 1885. In 1885 many Japanese people have a great longing to western culture. So we need to think and feel their longing and connect it to the next generation. Hikariya has old exterior and modern space inside. The huge kitchen ridge emits lights and give thanks to a past while lighting up the night sky. Hikariya-Nishi is based on local production. So the menu fits on nature and macrobiotic.